We have a mailing list of people looking for either the girl Lolly doll or this boy Cholly doll. I’m looking for Cholly, a Fisher Price 1977 doll No. 419. 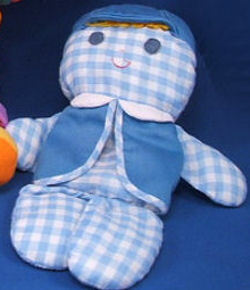 It’s a blue gingham plaid rag boy doll with yellow yarn hair with felt or vinyl eyes. He’s wearing a blue jacket and cap. My 31 year old son is expecting his first child and my first grandchild. Before he was born, my mom gave him a Cholly doll and as soon as he was born, it became his “security blanket.” He actually would never part from it as a baby and toddler, and we had to purchase several of them as he lost and wore them out. He drug it everywhere he went! I would love for his child to have one, but cannot find one anymore. I really want his baby to have one to love as much as he did! Please help me find this doll! This set looks as though they may have some but they are a bit spendy. Hope this helps. Thanks, Susan. I’ve contacted the mailing list for these dolls. There are two on Ebay right now. Thanks, Chiara. I’ve sent the links to the mailing list. I have the cholly boy version of this doll~the one in the picture. He is in very good condition and his fisher price tag is bright and not faded. Please let me know if there is anyone still looking. I will be listing him to our ebay store soon unless someone on here needs him. Thanks, Becca. I’ve sent your information to the mailing list. Yes, Becca, I am still interested in Cholly. this cholly is in like new condition~his tush tag is crisp and bright and he is not faded out in any way. I was actually shocked to see he was dated 1977 as he looks newer than that! I dont’ have your email address so I dont’ know how to contact you directly. I sent them your email address, but I do not give out the mailing list email addresses, so they should be contacting you shortly. A couple of them have already written,as they didn’t realize I’d given them your address. Thanks, Carrie!! Are you keeping track of how many you’ve found?? It has to be a LOT! Thanks, Anon. I’ve passed it along to the mailing list. PLEASE CONTACT ME IF YOU HAVE A NEW IN BOX CHOLLY! MANY THANKS! Please contact me as well if you have a Cholly doll in good condition, preferably in box. Cholly was our son’s favorite for years. He and his wife are having twin boys. Their first children and our first grandchildren. We would love to get 2 new in boxes. Please let us know. Thanks, Carrie! That should take care of most of the mailing list!